Connective tissue is derived from the third germ layer, the mesoderm. This is the very same source from which muscle tissue is developed. The types of connective tissue include adipose, fibrous, and elastic tissue as well as blood, bone, and cartilage. A characteristic that all connective tissues have in common is the presence of a matrix in addition to cells. Thematrix is a structural network or solution of non-living intercellular material. Each connective tissue has its own specific kind of matrix. The matrix of blood, for example, is blood plasma, which is mostly water. The matrix of bone is made primarily of calcium salts, which are hard and strong. Connective tissue consists of autochthonous fibrocytes. They form netlike structures over desmosomes and actin filaments. Fibrocytes are recognizable by their long, slim shape and their spindle-shaped nucleus. Their task is to synthesize proteins for the construction of the extracellular matrix. These proteins primarily include collagens and proteoglycans. However, proteoglycans consist only partly of proteins, the so-called “core proteins”. Long, repeating disaccharide units, glycosaminoglycans, are attached to these core proteins. Thus, proteoglycans are macromolecules with many hydrophilic elements. This enables them to bind with increased quantities of water, which contributes a gelatinous texture to the extracellular matrix. Collagen is a protein arranged outside the cells in collagen fascicles. The sequence of Glycine – Proline – Hydroxyproline amino acids are vital for the structure of collagen: This sequence is constantly repeated, sometimes with variations. Post-translational modifications like glycosylation and hydroxylation form the triple helix structure of procollagen. Procollagen, then, abandons its fibrocytes and becomes, through limited proteolysis, tropocollagen. Tropocollagen units congregate to form a primary filament. In the same way, primary filaments congregate to form collagen fibrils (also referred to as single fibers). The final part of the process involves the formation of the collagen fiber bundle, consisting of many single fibers. There are various types of collagen. The most important types are type I, II, III and IV. Collagen type I is widespread throughout the human body and is found in the skin, tendons, bones and tooth dentin. Type II collagen, on the other hand, is thinner and is primarily found in intervertebral discs, cartilage and in the eye’s vitreous humor. Type III collagen is the finest type of all and principally lies in smooth muscles, lymphatic tissue and bone marrow. In contradistinction to the aforementioned collagen types, type IV collagen is not fibrillar and is found in the basement membrane and lamina externa of the lens capsule. Connective tissue also contains immigrant, mobile cells from the blood and bone marrow, which function in the interests of the defense system. Supportive tissue consists of the bone and cartilage tissue. Chondrocytes are found in cartilage: They are cells with a shape ranging from round to oval, containing much glycogen and occasionally fat droplets. Chondrocytes evolve and regenerate until a person reaches the age of adolescence; adult chondrocytes lose the ability to proliferate. This is why in a specimen they are usually seen in isogenous groups. Such tightly packed chondrocytes are called “chondrons”. Chondrocytes are responsible for the matrix formation. This can be observed by looking at the dark chondron color, which is called territorial matrix or basophilic ring: it consists of newly formed matrix and stains darker due to its basophilic properties. When viewed in a light microscope, chondrocytes are already dead, since the specimen staining is a very slow procedure. As a consequence, cellular nuclei are often shrunken and deformed. Additional artefacts that may be present are the so called lacunae, which are formed by leaked cytoplasm. The cartilage matrix primarily consists of proteoglycans: aggrecan and hyaluronan, both of which bind with great quantities of water. Contrary to connective tissue, the cartilage collagen fibrils are not arranged in a parallel structure, but “arcade-like” (mainly type II). They prevent the disintegration of the gel and redirect pressure exerted on the bone, so that chondrocytes are not crushed. In a light microscope, the fibers of the cartilage are often masked and, therefore, not visible: This is due to their homogenous distribution between the aggrecans. Distinguishable refractive properties cease to exist. However, in aged cartilage, these fibers may be unmasked—a sign of degeneration, otherwise called “asbestoid fibers”. The cartilage tissue circulation is often poor. Nerves are also hard to find, since the mechanical pressure exerted on the cartilage would destroy all pathways. Because of these circumstances, cartilage has to manage with very few nutrients and is a bradytroph. It is supplied with the few nutrients that it needs through the synovial fluid, which is synthesized by the synovial cells of the joint cavity. Cartilage is also surrounded by connective tissue; the perichondrium. It consists of an outer fibrous layer and inner chondrogenic layer, where the latter produces new cartilage cells on the outside. Here, we are actually talking about appositional growth. In the human organism, there are four important types of cartilage. The embryonic or fetal cartilage contains evenly distributed chondrocytes with round nuclei. It constitutes the undifferentiated precursor of the other cartilage types. The hyaline cartilage is the most common type and typically includes chondrons of four to six chondrocytes. It contains masked collagen II fibers and is found, e.g., in joint cavities, the trachea, nose, larynx and the primordial skeleton. 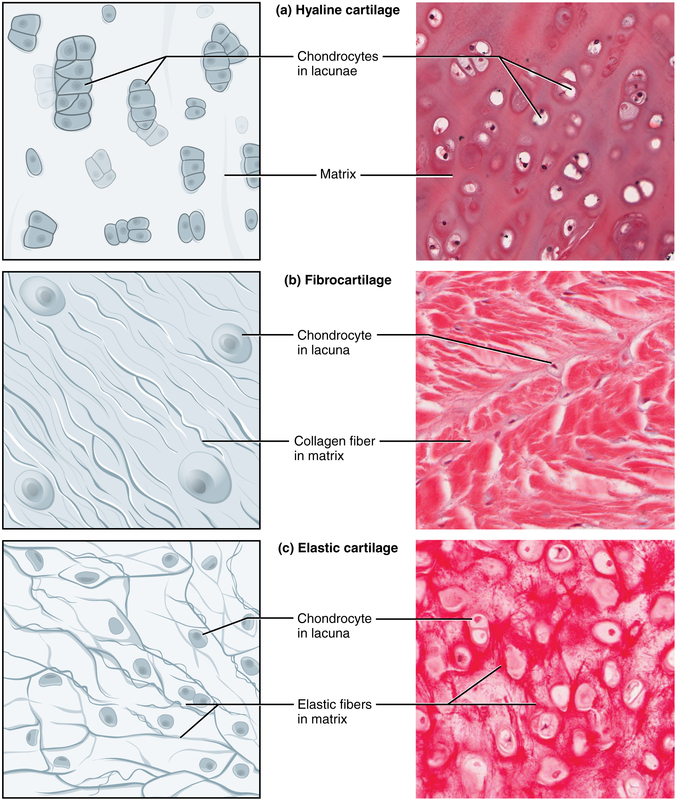 The elastic cartilage (or yellow cartilage) has more chondrons, which, however, contain only one to two chondrocytes. Its matrix is primarily made up of elastic fibers and few type II collagen. It is found in the auricle and in small bronchioles. 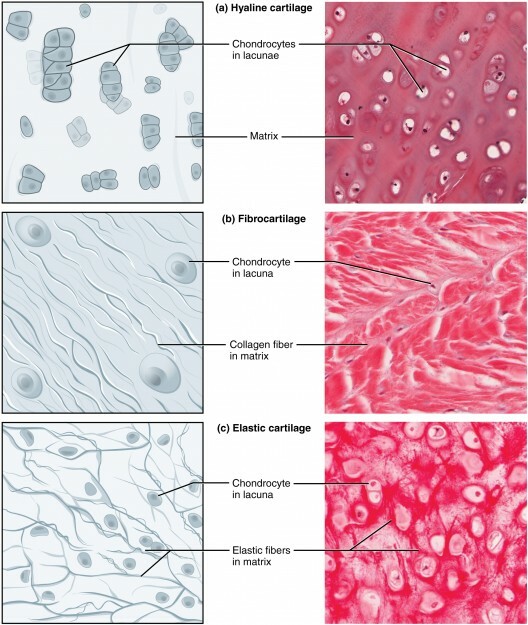 The fibrocartilage is a mixture of connective and cartilage tissue, where both fibrocytes and chondrons with one to two chondrocytes can be found. Its matrix contains collagen type I. Fibrocartilage is, e.g., found in intervertebral discs or cartilaginous joints. Quite contrary to cartilage—and despite their similar structure—bone tissue is not malleable. The difference can be found in the calcium apatite precipitating along the collagen fibers, which makes the majority of the tissue inorganic. You can find much more useful information about bone tissue in the article about bones. Adipose tissue is a special type of connective tissue. Its cells, called adipocytes, are differentiated and are responsible for fat storage. The fibers typical for the connective tissue move into the background. There are two categories of adipose tissue: white and brown. Brown adipose tissue is also named plurivacuolar adipose tissue, with its cells being small and round. Their nucleus is positioned in the middle and often broached. The cells are very well-supplied with blood and perform the task of heat generation. They are mainly found in newborns and young children, whereas in adults they are rarely present. White adipose tissue (monovacuolar adipose tissue) contains adipocytes of broad diameter which store fat. Their nucleus is located peripherally in the cell and is usually not broached. White adipose tissue is hardly supplied with blood. It is a sub-category of loose connective tissue and thus contains collagen type III fibers. White adipose tissue is responsible for storing energy and functions as a heat regulator, stuffing material and as a cushion. Recent research has discovered that adipose tissue does much more than provide a cushion or store energy. Adipose tissue is now considered an endocrine tissue, because it produces at least one hormone. Leptin is an appetite-suppressing hormone secreted by adipocytes to signal the hypothalamus in the brain that fat storage is sufficient. When leptin secretion diminishes, appetite increases. Adipocytes secrete at least two chemicals that help regulate the use of insulin in glucose and fat metabolism. Adipose tissue is also involved in inflammation, the body’s first response to injury, in that it produces cytokines, chemicals that activate white blood cells. Cellular mobility is based on motor proteins displaying ATPase activity. In muscle tissue, this mobility must be directed and coordinated, so that it can generate an effective contraction. The actin-myosin complex plays a vital role in this process, which is characteristic to muscle cells. Muscle is divided into three types: skeletal muscle, smooth muscle and cardiac muscle. Skeletal musclemay also be called striated muscle or voluntary muscle. The skeletal muscle cells are cylindrical, have several nuclei each, and appear striated, or striped. The striations are the result of the precise arrangement of the contracting proteins within the cells. The skeletal muscle cells are distinguishable by their long nucleus and striation, which can be observed only in longitudinal section and preferably in higher magnification. Single skeletal muscle cells build a syncytium in the muscles: they fuse and form a big cell, which can be up to 20 cm long. The syncytia are organized in parallel arrays, forming muscle fibers and, contrary to smooth muscles, they are not interconnected with gap junctions. 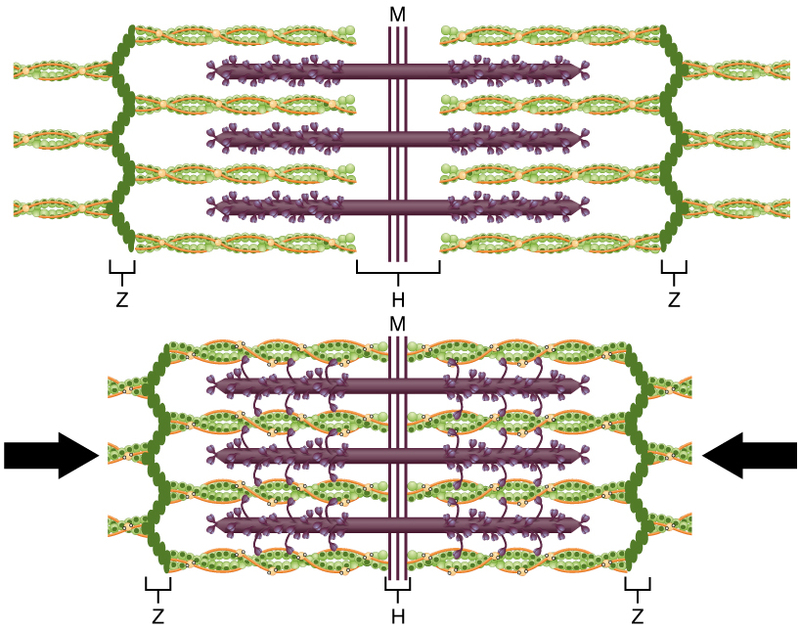 The sarcomere is the striated skeletal muscle’s functioning unit. It contains all the components essential to the contraction of the muscles. A sarcomere extends from one Z-line to the next. The barbed ends (plus-ends) of actin filaments are fastened by actinin on each Z-line. In-between the actin filaments are the myosin filaments, which are bound to the actin filaments by their heads. The myosin filaments reverse their polarity in the middle of their path. This location within the sarcomere is called the M-Line. Moreover, myosin filaments are elastically attached to the Z-lines by the protein titin, which also happens to be the largest known protein of the human organism. When observed under a microscope, the muscle displays different types of bands—something that causes the striation in the first place. The A-band refers to the anisotropic part of the sarcomere, which appears mostly dark and contains the entire length of myosin filaments. In the middle of the A-band, we can observe the H-band: lighter and containing only myosin filaments, with its limits being the overlapping point with actin filaments. The isotropic part of the sarcomere is called the I-band. It contains the Z-lines and actin filaments, appearing light in color when microscopically observed. During contraction, the Z-lines slide past each other, until the actin filaments “bump into each other”. The H-band also disappears. 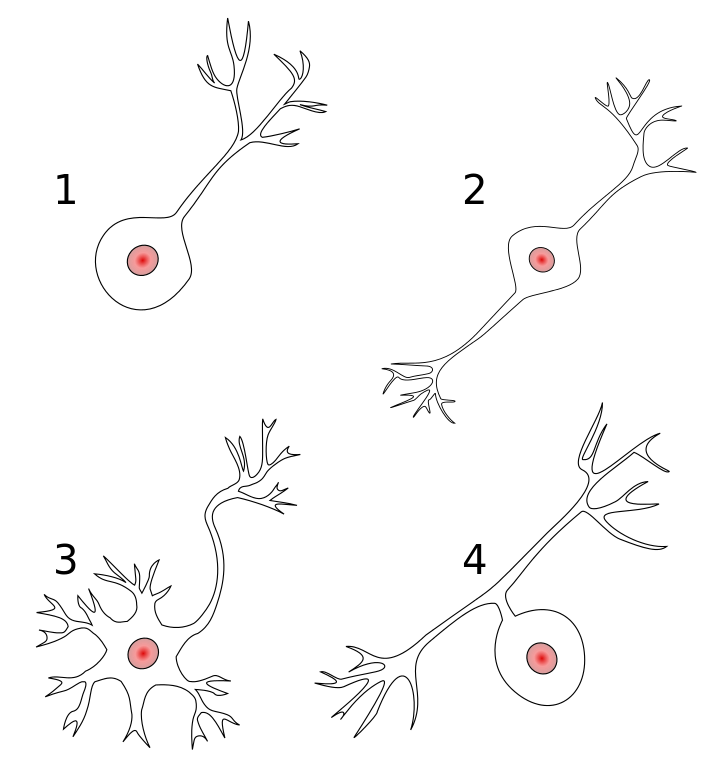 This motion is rendered possible through the cross-bridge cycle. The contraction is limited by the length of the actin filaments, therefore we usually speak of an active insufficiency. In cases of a more powerful stretch, the Z-lines are pulled so far from each other, that only the last myosin head is still attached to the actin filaments. In an even more powerful stretch, the result would be a filament rupture. This type of limited stretching ability is called a passive insufficiency. An optimal contraction requires all the syncytia to work together. This is why Z-lines from different cells are bound together by desmin. Moreover, Z-lines are fastened on the cell membrane by plectin. In striated muscles, this is referred to as sarcolemma and displays many invaginations (infoldings of one part within another), which run deep into the cytoplasm. These are called T-tubules (transversal tubules). Through these invaginations, the depolarization of the cell membrane can be quickly transferred to the inside of the cell. The endoplasmic reticulum of muscles is called sarcoplasmic reticulum and forms the longitudinal tubule system (L-tubule), which is responsible for Ca2+ storage. Striated muscle interacts with the connective tissue around it, so that endomysium, which is made up of collagen types III and IV, encompasses every muscle fiber. Connections between the extracellular matrix and muscle cells are rendered possible by focal adhesions, through dystrophin and integrin. Furthermore, satellite cells are found in-between the basement membrane and the muscle cells, which function as stem cells. Their “daughter cells” can fuse with muscle fibers and produce additional cell organelles or more elevated biosynthesis. In this way, the average number of fibers increases. About 20 muscle fibers are together surrounded by the internal perimysium, and about 20 of these fiber units are demarcated by the external perimysium. The epimysium extends around the entire muscle and runs all the way to the tendon. The perimysium and epimysium contain mainly collagen type I. The muscular connective tissue is vital to the stabilization, power transfer and individualization of the muscles in fiber groups. Additionally, it helps integrate the blood vessels and nerves into the muscle. In case of a severe muscle traumatization, connective tissue also forms a bridging, resulting in a scar and limited muscle mobility, since the muscle is no longer able to actively contract. Striated muscle fibers function according to the all-or-none law. That is to say, that they can either completely contract or rest. Our ability to apply different levels of muscular power depending on an action, is guaranteed through the innervation. Thus, in circumstances requiring less force exertion, fewer fibers are activated when compared to circumstances requiring great strain. Smooth musclemay also be called involuntary muscle or visceral muscle. The cells of smooth muscle have tapered ends, a single nucleus, and no striations.Smooth muscles are prevalent in the walls of hollow organs.They contract slowly, but more powerfully than striated muscles. Moreover, their tension can vary, rendering them able to maintain a real tone. Like striated muscle, the system responsible for the contraction of smooth muscles is the sliding of actin filaments. However, the contractile apparatus’ array here is shaped like a snake fence and should, therefore, be distinguished from the strictly parallel skeletal muscles. The actin filaments are bound together via the so called “densed bodies” (equivalent to the Z-lines), and the connection to the cell membrane is facilitated through adhesion plaques. The non-longitudinal structure allows the smooth muscle cells to contract in every direction. The network of the contractile apparatus running through the entire cell, draws the cell organelles in the vicinity of the centrally located nucleus: They are, therefore, considered perinuclear cell organelles. Smooth muscles also require their individual cells to work together in order to produce a contraction, and for this reason, most of them are connected with gap-junctions. This is referred to as a functional linkage and is not to be confused with the syncytium of the striated muscles. The functions of smooth muscle are functions of the organs in which the muscle is found. In the stomach and intestines, smooth muscle contracts in waves called peristalsis to propel food through the digestive tract. In the walls of arteries and veins, smooth muscle constricts or dilates the vessels to maintain normal blood pressure. The iris of the eye has two sets of smooth muscle fibres to constrict or dilate the pupil, which regulates the amount of light that strikes the retina. In a typical histological specimen of smooth muscle, one can observe the alternating longitudinally-sectioned and transversely-sectioned cells. In striated muscles, this is never to be observed, with the exception of tongue specimens. 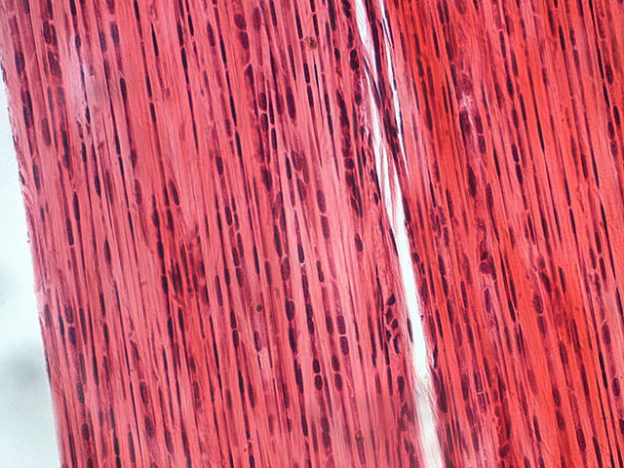 Since smooth muscle displays no striation, it is often confused by medical students with connective tissue. In order to avoid this misperception, one should take another good look at the netlike structure of the connective tissue, which is rich in extracellular matrix, and distinguish it from the poorly-matrixed smooth muscle tissue, which only approximately displays a parallel array. Cardiac muscle is often deemed an intermediate form between smooth and striated muscle. In reality, it encompasses structures from both tissue types. Just like smooth muscle, cardiac muscle is built from individual cells that form a functional syncytium with the aid of cell-to-cell adhesions and gap junctions. The first facilitate the mechanical linkage for the transfer of tractive forces, whereas the latter are responsible for the electric cooperation. The cardiac muscle is striated like skeletal muscle, but in very well-preserved specimen it displays the so-called intercalated discs. These are always to be found at the crossover spot of one cardiac cell to another and run orthogonally to the direction of the fibers. Most of the times they are dark in color or even black. The intercalated discs are typical findings in cardiac muscle as a result of adhesion and communicating junctions between individual cells. This enables the heart to beat in a very precise wave of contraction from the upper chambers to the lower chambers. Cardiac muscle is also known as the myocardium and forms the walls of the four chambers of the heart. Its function, therefore, is the function of the heart, to pump blood. The contractions of the myocardium create blood pressure and keep blood circulating throughout the body, so that the blood can carry out its many functions. Cardiac muscle cells can contract by themselves. Thus, the heart maintains its own beat. The role of nerve impulses is to increase or decrease the heart rate, depending upon whatever is needed by the body in a situation. Epithelial tissue covers surface areas of the body and contains no extracellular matrix. Because they have no capillaries of their own, epithelial tissues receive oxygen and nutrients from the blood supply of the connective tissue beneath them.Many epithelial tissues are capable of secretion and may be called glandular epithelium, or more simply, glands. 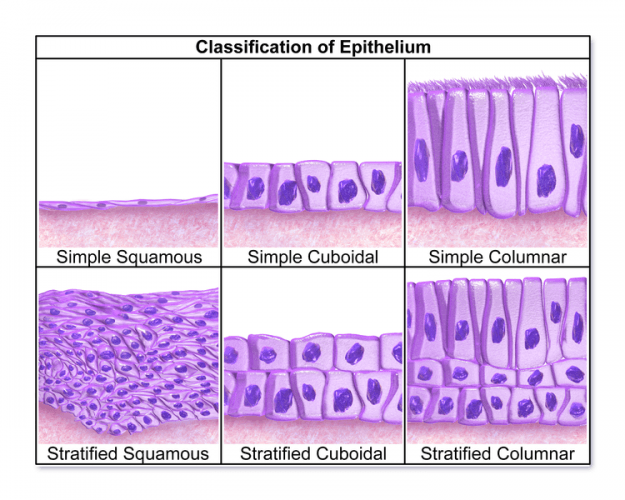 Due to the existence of multiple types of epithelia in the human organism, there is a complete article on the Histology of epithelia. Nervous tissue consists of nerve cells, surrounded by ten times as many glial cells. Both cell types are derived from the ectoderm. Quite similar to fibrocytes, nerve cells also build a netlike structure.Nerve tissue makes up the brain, spinal cord, and peripheral nerves.The nervous system has two divisions: the central nervous system (CNS) and the peripheral nervous system (PNS). The brain and spinal cord are the organs of the CNS. They are made of neurons and specialized cells called neuroglia. The PNS consists of all the nerves that emerge from the CNS and supply the rest of the body. These nerves are made of neurons and specialized cells called Schwann cells. Nerve cells are also called neurons and are responsible for processing the signals transmitted between chemical synapses. Their dendrites, varying in number and up to one meter long, pick up the neuronic signal and forward it to the also up to one meter long axon. The cytosol of the neurons is referred to as the perikaryon or soma. Neurons have the usual cell organelles, but display a lot of rough endoplasmic reticulum (RER), which is responsible for the incessant reparation of cell particles. This is particularly important to the neurons, as they possess very little regenerative ability and should, therefore, last for one’s whole life. The components of the rough endoplasmic reticulum are basophilic and have a typical blue stain. They can be observed in the soma but decrease at the point where the axon hillock begins. The substances produced in the soma must be transported over the whole length of the axon. This is called axoplasmic flow. Anterogradely, namely from the soma to the axon, the kinesin system is responsible for the transportation of the neurotransmitters, which are essential for the synapses. The retrograde flow from the axon to the soma is facilitated by the dynein system and is responsible for the axon’s feedback, namely the request for a new substance that is needed. In cases of pressure exertion, this flow is hindered, and one experiences a sensation as if their limbs have “fallen asleep”. Should this pressure persist for several days, e.g., due to a plaster cast on the lower leg without proper fibular head padding, the disturbance will become irreversible. There are different types of neurons, categorized by the numbers of the extensions protruding from their soma. Unipolar neurons have no dendrites, only a long axon, and are not very common cells. Bipolar neurons have a dendrite, which splits up distally, and an axon. They are typically found in sensory organs like the eyes and ears. Pseudounipolar nerve cells are bipolar neurons with merged axon and dendrite, and a sideways translocated soma. Since only one extension is observed, they are called pseudounipolar. They are mostly found in sensory nerves. Their cellular bodies make up the sensory ganglia, e.g., in the dorsal roots of spinal nerves. Multipolar nerve cells function as higher control centers and process information regarding the interconnection of multiple nerve cells. They are the type of neurons most commonly found in the central nervous system and have many, mainly short, dendrites and a single longer axon. There are many different types of glial cells, with distinct function and location. Ependymal cells are found only in the central nervous system and in small subarachnoid spaces, undertaking an epithelial-like function. Astrocytes are also exclusively located in the central nervous system and supply the neurons with nutrients, thanks to their star-shaped connections to blood vessels. Furthermore, they induce the formation of endothelial tight junctions and are responsible for the particular density of these blood vessels, playing an important role in the blood-brain-barrier (BBB). They also fill the extracellular space of the central nervous system. Satellite cells undertake the lining of the neurons’ somas in the peripheral nervous system. Oligodendrocytes and Schwann cells produce myelin around the neural extensions. In order to build such a myelin sheath, they wrap themselves around an axon and press their cytoplasm to the rim. In this way, a spiral structure is formed, consisting of cellular membrane and neural extensions, which actually constitutes an insulation sheath. That is why we speak of a given myelination of the extensions. Since the protein-streaked membrane cannot do completely without cytoplasm, the so called Schmidt-Lantermann incisures are left in the spiral. A Schwann cell is responsible for the myelination of a single extension, whereas oligodendrocytes wrap themselves around more extensions. The prefix “oligo” is derived from Greek and conveys the meaning of “enough”—in other words, not too many, but not one either. An unmyelinated axon, on the other hand, is an axon which is merely embedded in the cytoplasm of the Schwann cell. It is the only circumstance when a Schwann cell can surround multiple extensions. Signal transmission between unmyelinated fibers is considerably slower than the saltatory conduction of myelinated axons, which significantly increases the velocity of action potentials. In the latter circumstance, the action potential is propagated from one node of Ranvier to another, namely from the locations between two Schwann cells or oligodendrocytes, where there is a myelin sheath gap. The part of the extension that is insulated by a glial cell is an internode. An internode is, therefore, always found between two nodes of Ranvier. The longer the internode, the quicker the signal transmission. The internode’s length depends on the size of the glial cell: it gets bigger as the extension’s thickness increases. Α nerve’s conduction velocity ranges from one to a hundred meters per second. Microglia are an exception to the rest of the glial cells, since they are derived from the bone marrow and have developed from the mesoderm. They are categorized under the macrophages and function in the interests of the nervous system’s defense. They can also be referred to as mesoglia or Hortega cells. You can find the answers underneath the references. Connective tissue is a thick cellular compound with little extracellular space. 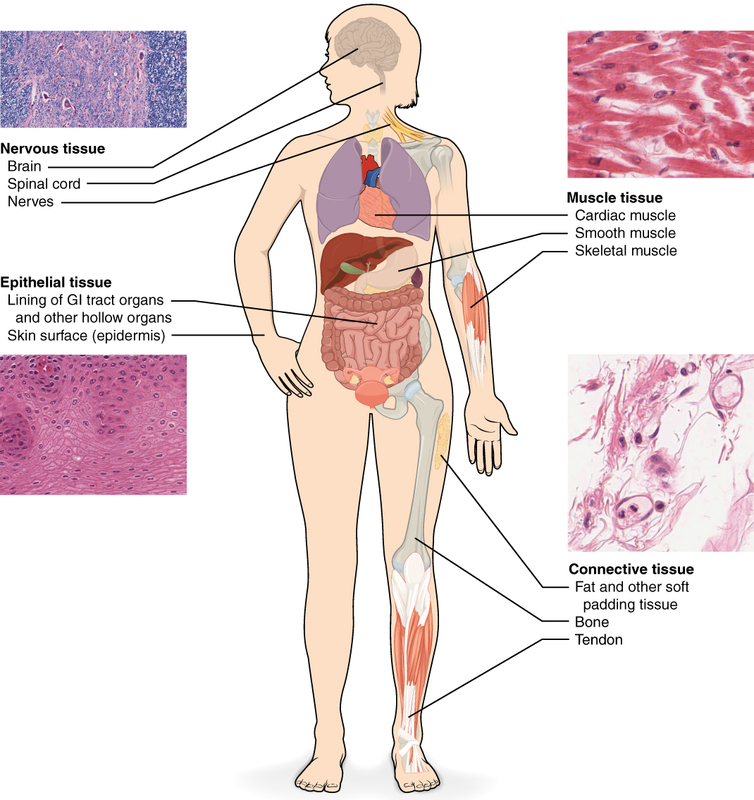 Connective tissue is a special type of epithelial tissue. Connective tissue contains collagen fibers and proteoglycans. Connective tissue is one of the most uncommon tissue types of our body. Connective tissue is involved in the signal transfer process. 2. Which of the following statements is most accurate concerning muscle tissue? Muscle tissue is recognizable by its round, disorderly cells. Compared to the striated skeletal muscle, smooth muscle contracts in a slower but more powerful way. During contraction the H-bands are widened. The cardiac muscle cells fuse with each other and form a syncytium. Striated muscle fibers can contract and produce varying power. 3. Which of the following statements is most accurate concerning nervous tissue? Nervous tissue is derived from the mesoderm. Nervous tissue consists primarily of neurons. 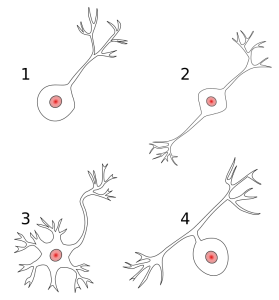 Neurons have exactly one dendrite, but multiple axons. Glial cells are found in the central nervous system. A foot that has “fallen asleep” is caused by the blockage of the axoplasmic flow. BioCam Communications, & Southern Biological. (1994). Nervous tissue. Kelowna: BioCam Communications. Junqueira, L. C., Mescher, A. L., &Junqueira, L. C. (2010). Junqueira’s basic histology: Text and atlas. New York: McGraw-Hill Medical. Peachey, G. (1992). Epithelial tissue. Kelowna: BioCam Communications, Inc.
Polak, J. M., Mantalaris, S., & Harding, S. E. (2008). Advances in tissue engineering. London: Imperial College Press. Siliciano, A. M., & Educational Images (Firm). (1982). Histology of basic tissue types. Lyons Falls, NY: Educational Images.